Story That Kim Jong Un Fed Uncle To Dogs Was Probably Satire : The Two-Way The story appears to be false because it originated with a satirical post on a Chinese microblogging site. The post was picked up by a Hong Kong newspaper and then reported as fact around the world. 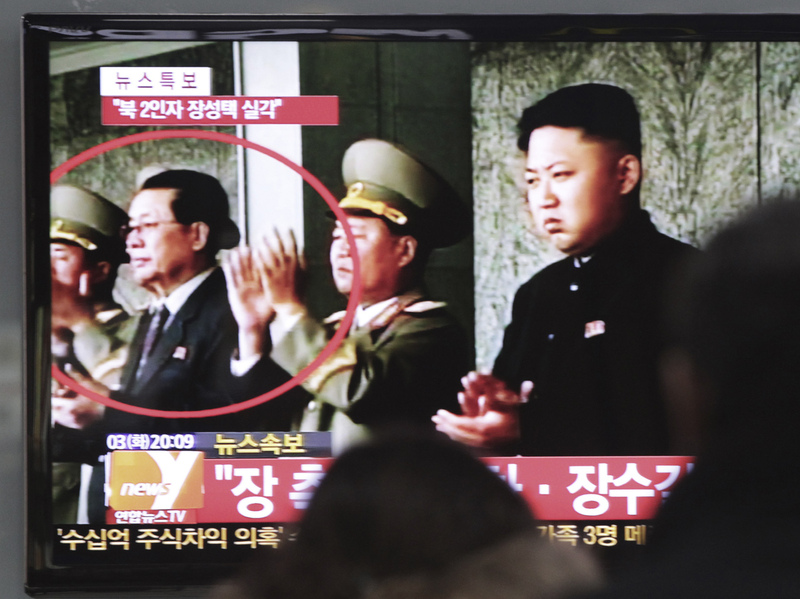 People watch a TV news program showing North Korean leader Kim Jong Un, right, and Kim's uncle, Jang Song Thaek, circled in red, at the Seoul Railway Station in South Korea on Dec. 3. Well, Mark did warn us. Reports last week that North Korean leader Kim Jong Un executed his uncle and then fed him to dogs appear to be false. We say "appear" because the story first originated in a satirical post on Tencent Weibo, a Chinese microblogging site. This isn't the first such story that's been reported as legitimate news. There was the time The Onion proclaimed Kim its Sexiest Man Alive in 2012. That story got picked up by China's People's Daily.